A whipped chocolate mousse entwined with our citrus and berry botanicals makes for the perfect autumnal dessert. 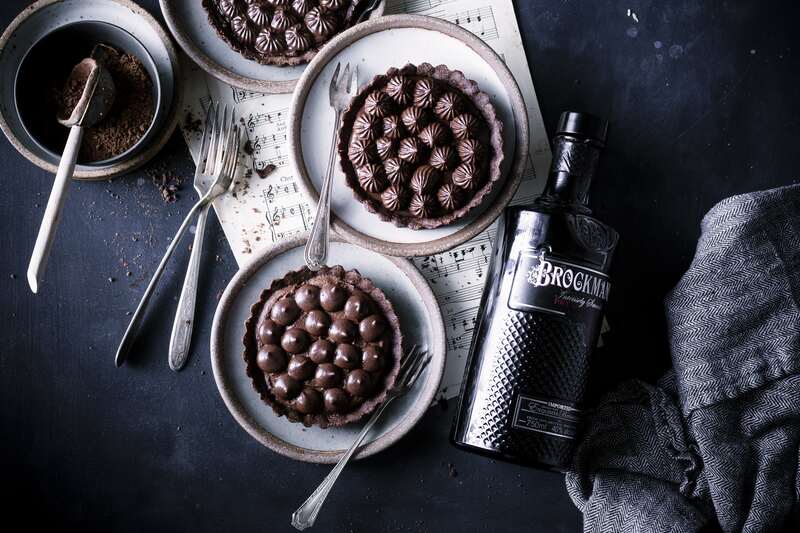 What’s better is that it’s set atop a gin chocolate tart, adding more indulgence to your evenings. In a mixer fitted with a paddle attachment cream the butter and confectioners sugar until light and creamy. Add egg yolks one by one and beat until they are well incorporated. Add vanilla essence and mix well until combined. In a bowl mix together the all purpose flour, almond flour, cocoa powder and salt. At the lowest speed add the flour mixture and beat until just combined. Transfer the tartlets to a baking sheet and freeze for 30 minutes. Preheat the oven to 115C/340F. Now remove the baking sheet from the freezer. Cut out five circles of parchment paper to the size of the pan, and place a circle on each tartlet pan before placing pie weights or dried beans over them. Place the pans onto the baking sheet and bake the tartlets for 25 minutes. Then take out the tartlet pans from the oven and remove the pie weights and the parchment paper from all the tartlet pans and place them back into the oven for 11 to 13 minutes longer. 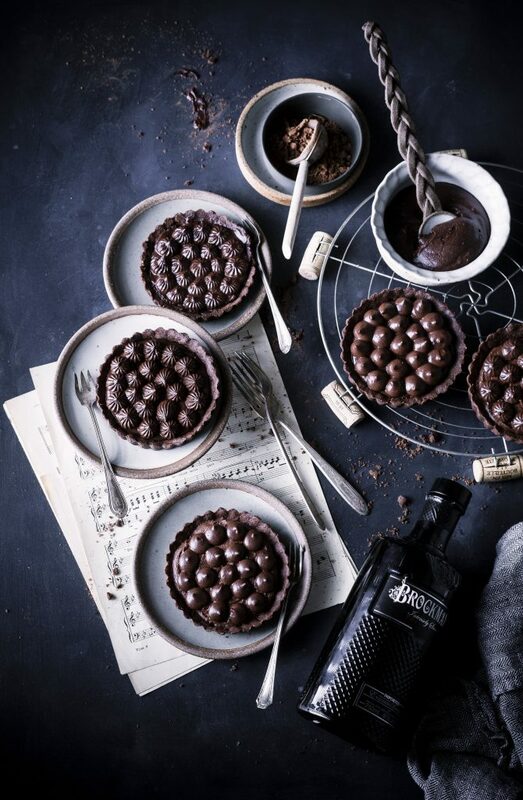 Remove the tartlet pans and allow them to cool completely. When baked, it should look dry and the edges should be firm to touch. Dissolve the cocoa powder and espresso powder in hot water without lumps. Allow to cool completely. Melt the chocolate chips using the double boiler method. Allow to cool completely. 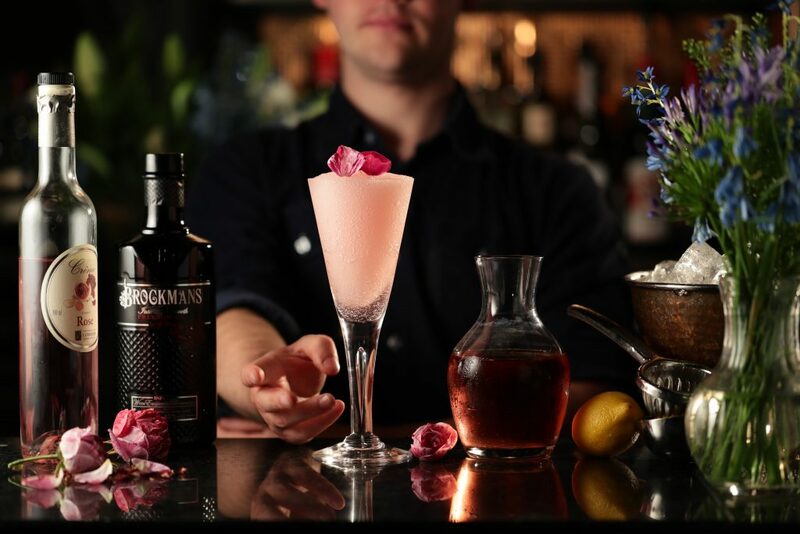 Take a tbsp of the cocoa and espresso mixture, add the Brockmans Gin, mix well and refrigerate for ten minutes. Whip the cream to stiff peaks with powdered sugar. Mix the refrigerated gin mixture, the remaining cocoa and espresso mixture and melted chocolate well. Fold the above mixture to the whipped cream until well combined. Refrigerate the mousse for 30 minutes. 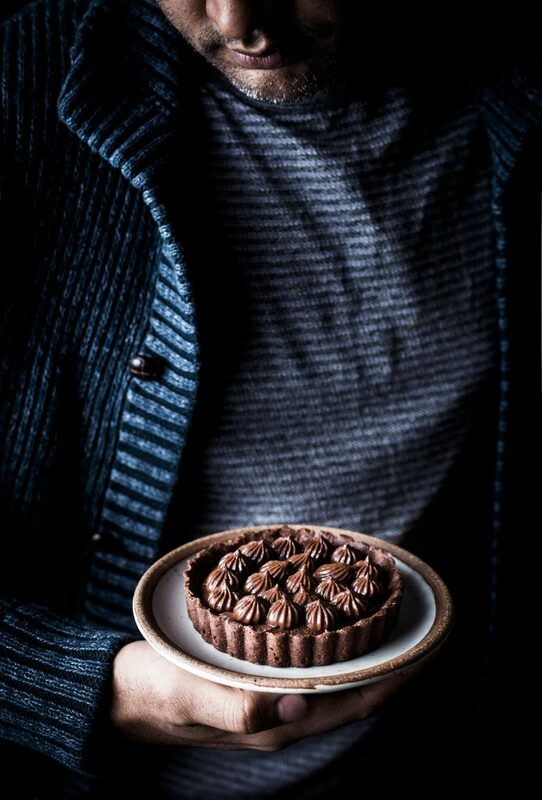 Take a tartlet crust and fill it with the mousse. Then pipe the mousse using your favourite piping tip of choice.